Stitches worked on a canvas ground in needlepoint require special threads and fibers. They must be long and strong enough to withstand continuous pulling through stiff canvas mesh as each needlepoint stitch is made. Yarns and other threads used in knitting, crochet, and other embroidery crafts do not work well for needlepoint because they have short fluffy fibers that tend to fuzz and break with repetitive stitching. There are many different types of needlepoint yarns and decorative threads that can be used. Here are the most common. Persian Yarn: By far the most popular yarn used for needlepoint, Persian wool can be purchased in hundreds of colors from delicate hues to bold shades. It comes from the factory spun as a single 3-ply thread, which makes it a very versatile yarn. The 3 plies can be separated into individual strands for fine stitching or used all-together to work a needlepoint project on larger mesh canvas. When all the strands are used as one, Persian yarn has the same thickness as tapestry wool. Tapestry Yarn: Tapestry wool is a single strand thread that cannot be separated for fine stitching. This one strand is thick enough to adequately cover #10-mesh mono needlepoint canvas without having to double it. It is usually sold in 8.8-yard skeins, with some needlepoint shops offering hanks for working larger needlepoint projects. Crewel Yarn: Crewel wool is best known for its use in working Crewel embroidery on fabric. This fine weight yarn is similar in texture to one ply of Persian yarn. Crewel yarn is great for blending and detailed work—especially when stitching on #18 to #22-mesh single thread canvas. For larger mesh canvas, you can easily add one or more strands in the tapestry needle to get the proper coverage. Other threads like cotton, silk, metallics, and novelty threads can be used very successfully in needlepoint. They do not have the durability of wool yarn but tend to work best for decorative projects that will not see a lot of wear and tear. Cotton Thread: Spun as individual strands and sold in groups of 4 to 12, cotton threads are the least expensive of all needlepoint yarns. Depending on what’s needed for good canvas coverage, each group can be pulled apart or “stripped” and put back together with the number of strands required before threading the needle. This stripping is critical if you want your stitches to look smooth and even. Pearl or shiny cotton is an offshoot of basic cotton needlepoint thread. It cannot be separated, but it comes in a variety of sizes to fit most canvas mesh. 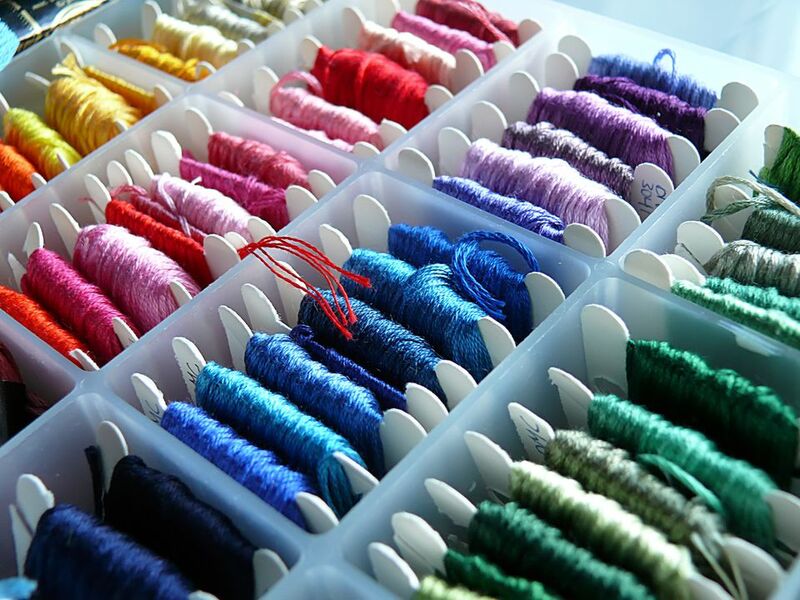 Silk Thread: By its very nature, 100 percent silk is more expensive than cotton or wool. The wispy thread is very delicate and seems to have a mind of its own. Lots of care must be taken when working with silk as the strands either tend to cling to each other or one or more of them will stick out when placing a stitch. For this reason, a laying tool or trolley needle must be used to stroke the threads into place. Even so, if you want a rich shiny accent for a needlepoint flower or other motif, use silk thread for successful results. Metallics and Novelty Threads: There are so many threads that fit this category that it is hard to keep up with new ones released each year. Metallic braids, ribbons, and cords can be purchased in different sizes in a variety of shades of any color you need. Novelty threads include patent leather, ultra-suede, fur, glow-in-the-dark, and more. Many of these threads are “un-stitchable” and can only be couched with surface embroidery. Others work best for #10 to #12 mesh canvas. To avoid major dissatisfaction, if you are unfamiliar with a particular yarn or thread, work a one-inch sample in the needlepoint stitch you will be using on a piece of scrap canvas that’s the same size mesh as that of your needlepoint project. Needlepoint yarns and threads are typically sold by the skein or card. In some shops, Persian or tapestry yarn may also be sold loosely by weight or by length. Always buy more thread than you need, making sure it is from the same dye lot.